Monson: Can the Jazz conquer their playoff problem? (Trent Nelson | The Salt Lake Tribune) Utah Jazz forward Jae Crowder (99), Utah Jazz center Rudy Gobert (27), and Utah Jazz forward Derrick Favors (15) on the bench in the final seconds of the loss, as the Utah Jazz host the Oklahoma City Thunder, NBA basketball in Salt Lake City on Monday March 11, 2019. The Jazz have a playoff problem. In the years in which they qualify, they can’t get past the second round. And now … they face the Rockets in the first. Last season, they beat the Thunder, 4-2, in the initial series, then lost, 4-1, to the Rockets in the second. The season before, they sank the Clippers, 4-3, in the first and got swept by the Warriors in the second. In five of the previous six seasons, the Jazz didn’t make the playoffs. The one year — 2011-12 — they did, they were promptly swept by the Spurs. From 2007 to 2010, the Jazz were eliminated each of those three postseasons by the Lakers, twice in the second and once in the first. The last time the Jazz broke through the barrier, making it to the conference finals, was 12 years back, when they edged the Rockets, 4-3, in the first round, beat the Warriors in the second, 4-1, and were chased out by the Spurs, 4-1, in the third. In the three seasons before that, the Jazz did not qualify at all, and the five prior to that drought, they could not find their way past the second round, getting eliminated in the first round three of those years, and in the second twice. It means going from mediocre to good in the NBA is easier than going from good to great. The Jazz have not been able to do it. Kyle Korver has been Quin Snyder’s creative new weapon this season. Here’s how he’s deployed. How healthy are the Jazz entering the playoffs? Join us in reading the tea leaves. When Dennis Lindsey took over the team’s operation, he repeated again and again that the Jazz would not skip steps. They haven’t. They absorbed the loss of Gordon Hayward and powered on. They made some bad choices in the draft — moving up to take Trey Burke, taking Dante Exum with the fifth overall selection, taking Trey Lyles over Devin Booker — but they also absolutely nailed it, hauling in Rudy Gobert and Donovan Mitchell. The Mitchell pick was particularly significant, considering the Jazz needed offense and a franchise spark after losing Hayward and some hope, and they gained both using that 13th pick in the best way possible, moving forward again. Since then, the Jazz have made only minor moves, allowing the current roster to develop and jell. And it has — to an extent. The Jazz won 48 games last season and 50 this time around. But nobody really remembers the minutiae of the regular season. That stuff is for entertainment purposes only. The authentic test comes next, in Houston on Sunday night and thereafter in the playoffs’ opening round. There will be plenty to slice and dice, to chuck up into the air and let fall back down onto the sizzling grill, like steak and shrimp at Benihana’s, as this series transpires. And if the Jazz, somehow, are fortunate enough to advance, there, in all likelihood, in the second round will be the Golden State Warriors. Which will bolster the same barrier the Jazz have been unable to break through. One or two rounds and out. Who knows? Maybe the Jazz can shock the world, and beat James Harden and the Rockets and Steph Curry and the Warriors. It’s just not the way to bet. No … it’s inconceivable. 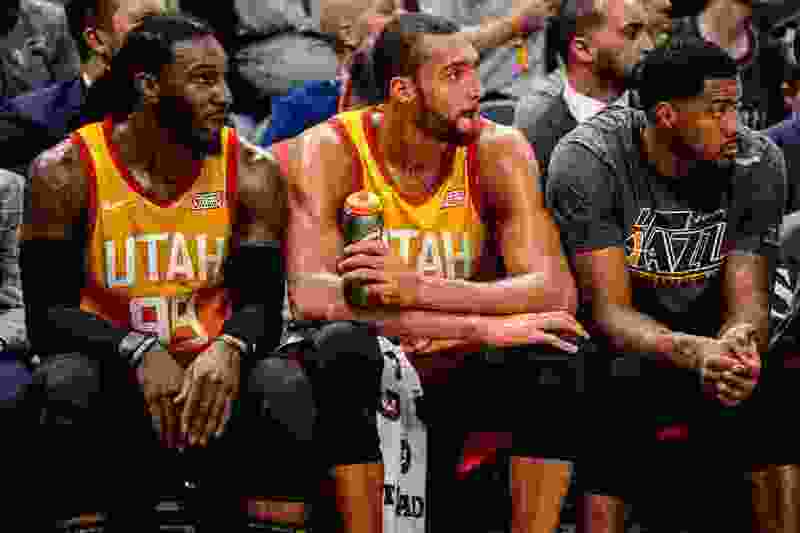 Even if the Jazz, despite regular-season records and playoff positioning, were one of the top four teams in the NBA, they could be sent packing in the first round. And a part of that comprehensive burden is the difficulty for the Jazz in lowering their handicap from a 7 to scratch. The analogy fits. In relative terms, it’s easier for a reasonably athletic/coordinated young golfer, under proper instruction, to go from, say, a 16 to a 7. Getting from a 7 to scratch is a much steeper climb. The Jazz are scaling a cliff, one that over some sections is leaning toward them. They must get better — either by way of their own substantial growth this postseason, or by reinforcing that growth via a major move in the offseason for the postseasons ahead. Either way, the next couple of weeks are important in the ascent, the shaving off of strokes. That’s a mixed metaphor, but the point is clear: The first- and second-round challenge awaits. It always awaits. Anything beyond that — when or if it happens — will signify what the Jazz have indicated as their goal for years now: true contention.